Despite their role in the hellish wrath of the black death and the infuriating tenaciousness of a household infestation, fleas seem to have endeared themselves to mankind more than any other ectoparasitic arthropod, appearing in our art and literature with vastly greater frequency than mosquitoes, lice, bedbugs and especially their arachnid partners in crime, the ticks. 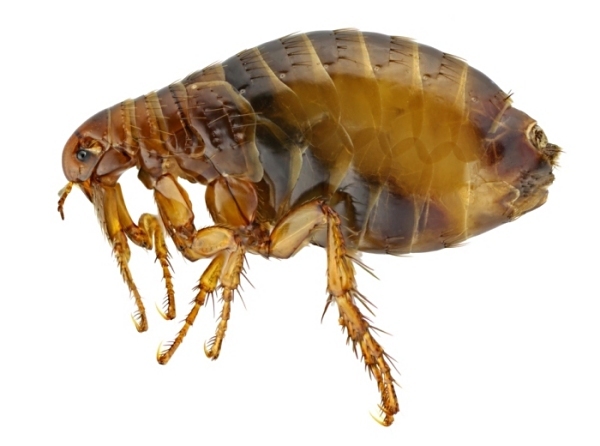 Any child knows that fleas are strange little biting creatures who live in the fur of our canine and feline friends, often the first example of parasitism ingrained in our young minds. 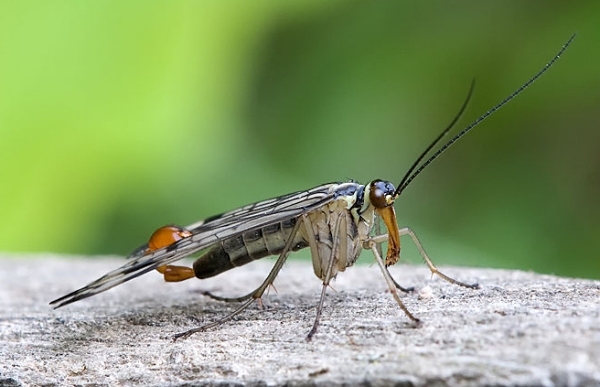 These amazing creatures were once assumed to have evolved from the Diptera (flies) and were placed in their own order, the Siphonaptera, but modern genetic analysis suggests that the fleas can be considered a highly specialized group of flightless, sanguivorous Mecoptera, a group of normally winged insects sometimes known as "scorpionflies." 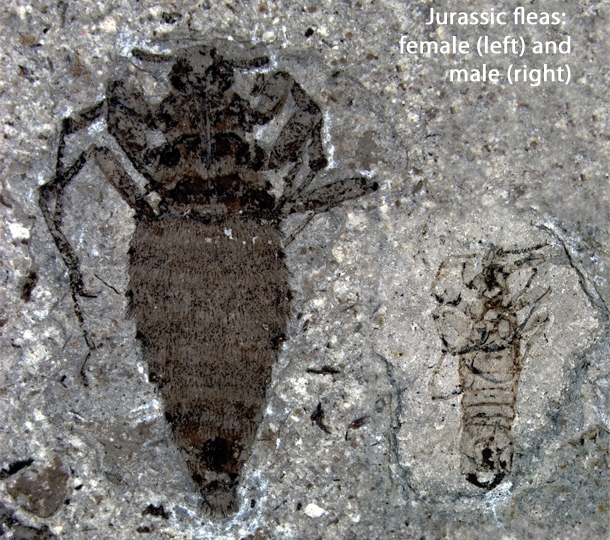 Ten times the size of their modern descendants, the oldest known fleas were dorsally flattened, like ticks, unequipped for leaping and sexually divergent; on the right is the fossilized male, dwarfed by the female and with prominent, forcep-like genitalia. With their long and sturdy piercing mouth parts, these "giants" most likely (and appropriately) fed on the blood of feathered dinosaurs. 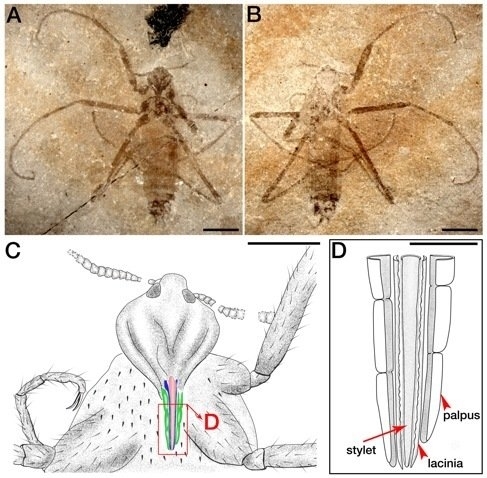 In 2013, another ancient flea was formally described, demonstrating some characteristics closer to its modern descendants. Saurophthyrus exquisitus apparently fed on the blood of thin-skinned pterosaurs, using smaller, daintier mouth parts to feed while causing minimal disturbance to its host. 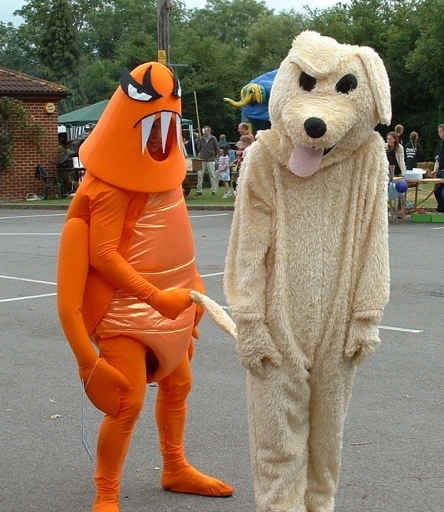 Over a hundred million years later, the modern flea is a marvel of parasitic ingenuity; laterally flattened, like a fish, and evenly lined with backswept spines, their bodies are completely streamlined for rapid movement through dense fur or feathers, their blunt antennae even folding flat against grooves behind their eyes. Already paper thin, they can be virtually impossible to kill by pure crushing pressure, and a "mustache" of vicious barbs anchor them firmly to flesh as they feed on blood. We can see that they long ago lost all trace of wings, which would only encumber their mobility through a host's coat, but soon evolved to compensate their flightlessness with powerful "spring loaded" jumping legs, capable of launching them up to 200 times their body length in the blink of an eye. Long considered the champion jumpers of the animal kingdom, their record was only marginally broken by certain species of plant-feeding Froghopper. Like flies, fleas undergo a complete metamorphosis including an entirely limbless, blind larval stage resembling a maggot. 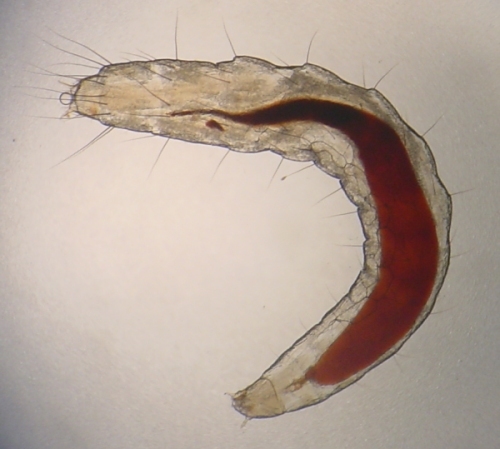 Unable to bite, flea larvae are scavengers who thrive off shed hair, skin cells, and especially the excess blood defecated by adults, with some species even fully dependent on their dutiful mother's droppings to survive. Pupating in silken cocoons, the mature fleas may lie dormant for months until a viable host is detected, tiny vampires slumbering in hairy, organic coffins. 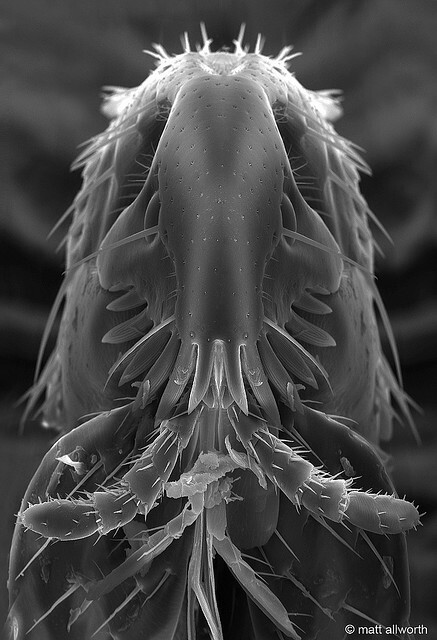 While most fleas move freely about the host and their nesting materials, one small family, the Hectopsyllidae, diverges in the bizarre and disturbing ways you know you love to read about and I love to write about. 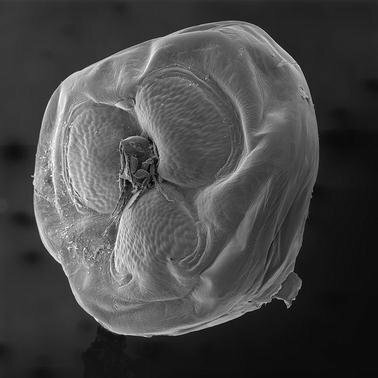 Sometimes known as chigoe fleas, stick-tight fleas, sand fleas or "jiggers," females actually entomb themselves in the skin of their host, breathing and excreting through their exposed posteriors as they guzzle blood from the victim's veins. 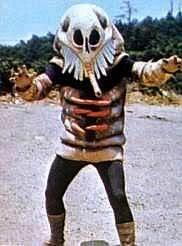 Fully mobile males will mate with these embedded females, whose bodies bloat with eggs until nearly the size of a pea. Fortunately, eggs are desposited well outside the surrounding skin lesion, but mommy will eventually die right where she is, still swollen and still lodged painfully under the flesh as she decomposes. Not surprisingly, these attack sites often lead to severe secondary infections. Although they've spent eons gorging on our blood only to poop most of it, a certain affection for fleas in human culture can be traced back hundreds of years, most notably when the flea circus had become a popular sideshow attraction in the eighteenth century. Often these novelties were fully mechanized without any live insects, but real fleas were sometimes used as well, tied or glued in place where their struggling could manipulate miniature props. 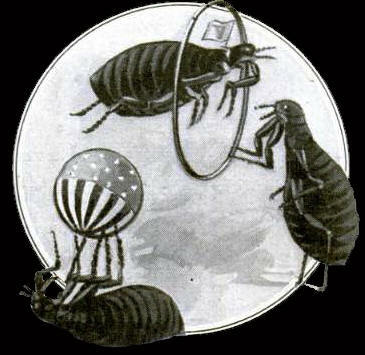 It was often the circus association that made fleas such a popular subject of cartoonists, with dozens of early animated shorts featuring the parasites as clowns, acrobats or other entertainers. Still other cartoons would simply cast fleas as the comic foils of dogs and cats. 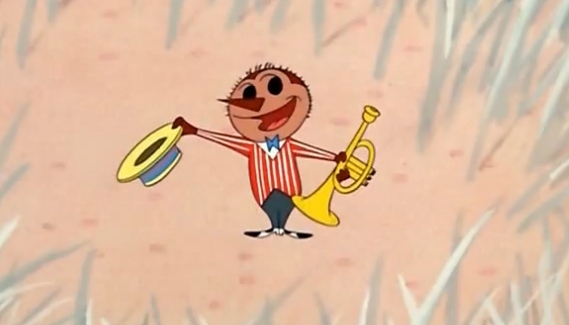 Very rarely did any of these characters actually resemble fleas, if they were even drawn like insects at all, but I always thought Pee-Wee Flea here from the hit Dixieland Droopy was a perfect compromise between a realistic and anthropomorphic Siphonapteran. Look at his little proboscis! More recent animated roles have included the entertaining if minor P.T. 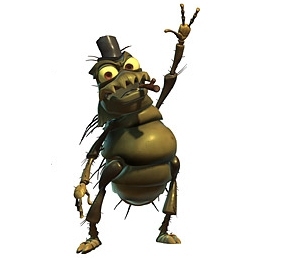 Flea from A Bug's Life and more significant (if less life-like) Francoeur from A Monster in Paris. Despite their bizarre appearance and ghoulish lifestyle, fleas are only rarely the basis for monsters in fantasy and horror. 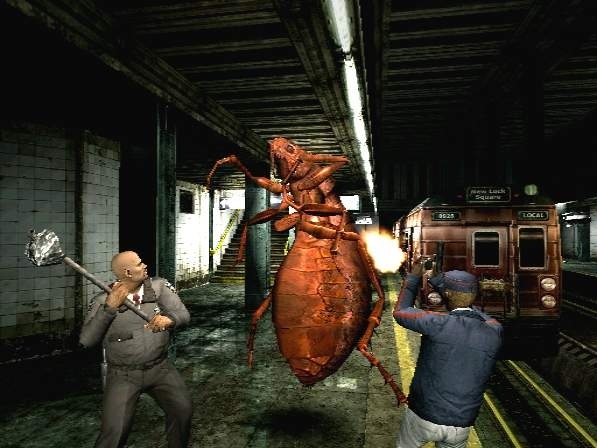 Huge fleas appear briefly in the Resident Evil franchise and sporadically as rubber-suited villains in Japanese Tokusatsu series, but we've yet to see them rise to horror stardom. Ticks have their own B-movie and mosquitoes have several, so where's our gargantuan CG fleas slurping the innards out of horny teenagers? As frustrating as they are to contend with, I've always counted these little bastards among my favorite living organisms. Resembling some bio-mechanical, embryonic hybrid of a pinecone and a piranha, there's nothing I don't find lovable about these springy, prickly Nosferatu of the microcosmos...as long as I can admire them from a safe enough distance.